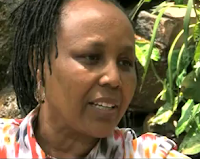 Veteran filmmaker and producer Jane Murago-Munene was trained at Voice of Kenya, the name was later reverted back to Kenya Broadcasting Corporation. Her first production, The Tender One, was produced during the first United Nation’s International Year of the Child in 1979. It was this UN project that made her realize her interest in documentaries as they “give you a chance to tell things as they are and a chance to go deeper into issues than you would otherwise do”. Founder of CineArts Afrika in 1990, she is also chairperson of the Kenya National Film Association and Eastern Africa regional secretary of FEPACI (the Pan-African Federation of Filmmakers). Other works to her credit include: The Chosen One co-directed in 1991 with Dommie Yambo-Odotte, the 14-minute documentary Women, Water, and Workload (1994), Enkishon: the Maasai Child in Kenya (1995), a 28-minute documentary. Out of Silence, a 23-minute documentary produced in the early 2000s. The fiction films The Price of a Daughter and Behind Closed Doors were released in 2003 and 2004 respectively. The most recent production, Turning Tide: Women Entrepreneurs in Africa is a 13-part series made in 2008 in collaboration with the (IFC) International Finance Corporation, a member of the World Bank Group, to showcase successful businesswomen from Ethiopia, Kenya, Rwanda, Tanzania and Uganda. It has been also broadcast in those countries. "This series looks at the challenges businesswomen face in Africa and how these challenges can be overcome. I hope their stories will serve as inspiration to other women who dream to begin their own business." Capital Talk with Jeffrey Koinange, in four-parts, features Jane Murago-Munene discussing her journey into film production and the significance of the Turning Tide: Women Entrepreneurs in Africa project.